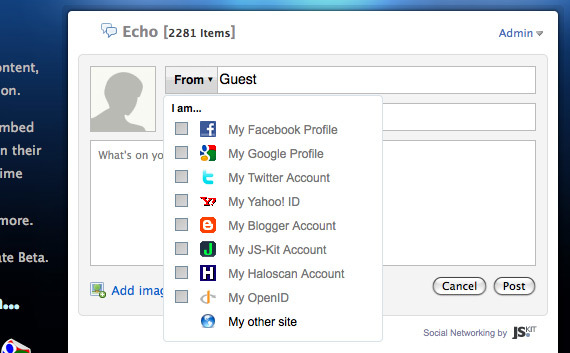 Echo allows readers to identify themselves with existing identity providers (ie. Google, Facebook, Twitter, OpenID). Readers do not need to create a new identity for every website they visit; instead, readers retain their existing identity and social capital with their current identity provider. Once identified, readers contribute to the conversation and simultaneously distribute their input to their own social networks. Echo is a brilliant attempt to unify and strengthen online conversation by leveraging the power of weak ties. Echo encourages the conversation to bridge social graphs by enabling readers to distribute their thoughts to their own networks while simultaneously contributing to a unified conversation. This scenario is best described by Mark Granovetter 's ground-breaking sociological work The Strength of Weak Ties. Echo benefits both content authors and content consumers; Echo exposes content authors to a larger, more diverse online audience than ever before; Echo also encourages consumer participation by maintaining and improving consumers' existing social capital. For example, I love reading ABC Widgets' blog, and I want to comment on one of ABC Widgets' latest blog posts. Fortunately, ABC Widgets just installed Echo for all of its blog posts. First, I choose my identity: do I identify myself using my Google account or my Facebook account? I choose my Facebook account and authenticate myself with my Facebook login credentials. Next, I choose to where I would like to send my comment. I would like to send my comment to my Twitter followers and my Facebook friends. After providing my Twitter credentials, I submit my comment. Now, my comment is added to ABC Widgets' blog post, it is sent into my Twitter stream, and it is posted to my Facebook profile for my friends to read. Any further re-tweets in my Twitter stream or comments from my Facebook friends will be aggregated and collected into the conversation's echo and displayed on the original ABC Widgets' blog post page. However, some pundits fear Echo may work too well. Echo publishes all facets of the conversation from all nodes of the affected social graph. This includes negative feedback, spam, flames, and more. Due to the real-time nature of Echo, it may be difficult for content authors to adequately moderate the conversation; is it possible for one author to monitor a real-time conversation all hours of the day? Power of opinion may transfer from content authors to content consumers. Echo does include moderation features, but specific details are forthcoming. Echo is currently in Private Beta. You can learn more at http://www.js-kit.com/echo/. I like this a lot. It will be interesting to see what Disqus does. Would like to see the 2 compete too.